What’s the best age to learn to code? Certainly, you can never start too early or get into the field too late: a recent analysis of 26 million job postings found nearly half of jobs in the top salary quartile require some coding skills. Yet fewer than half of all schools teach coding, leaving today’s learners unprepared for tomorrow’s workforce. Organizations committed to helping close the looming skills gap, will ultimately support the next generation of STEM leaders and ensure they have the opportunity to succeed. It’s important for companies to invest in and partner with organizations that teach science, technology, engineering, and math (STEM) skills to kids, such as Black Girls Code and Girls Who Code. That’s why we’ve launched our own initiative, Capital One Coders, to do our part to train the future generation of tech leaders. Coders is part of our larger Future Edge initiative that empowers individuals, families and small business owners to succeed in today’s digital economy. When we were pioneering the program early on, I led a class teaching middle-school girls how to use Raspberry Pi devices to create simple programs. One girl went home and quickly built an automated system to run her family’s chicken coop. She made the door open at a specified time each morning, so she didn’t have to wake up to do it, and then had the lights turn on at a certain time to keep the chickens warm. She saw a problem and promptly figured out how to solve it. I knew right then that middle school was a great time to teach coding; kids that age are creative, inspired, and thoughtful—and many are natural technologists, savvy with social media, smartphones, and computers. With looming gaps in education and earnings, it’s important to teach kids digital skills to prepare them for the future workforce. But it’s also important to inspire them, have fun, and support their dreams. Community-based program meant to inspire kids to think creatively, solve problems, and dream big are one way to achieve this. Certainly, middle school is a time everyone remembers and the wider tech community has lots of advice for kids this age. Recently, at the Grace Hopper Celebration of Women in Computing, we placed an interactive wall in its booth where we asked conference attendees to write notes to middle schoolers to support them in choosing STEM careers. Hundreds of current technologists wrote notes to kids, who received them later on at school, and some of them were truly inspiring. “Technology is about more than tech. It enables and empowers medicine, finance, science, art, and more,” read one. “If you want to create magic, learn to code…it’s like having a wand to create your own little world of dreams,” read another. Training tomorrow’s technologists will take a massive effort from schools, corporations, nonprofits, and government agencies, but everyone can do their part to help “lift all boats” in the digital economy. 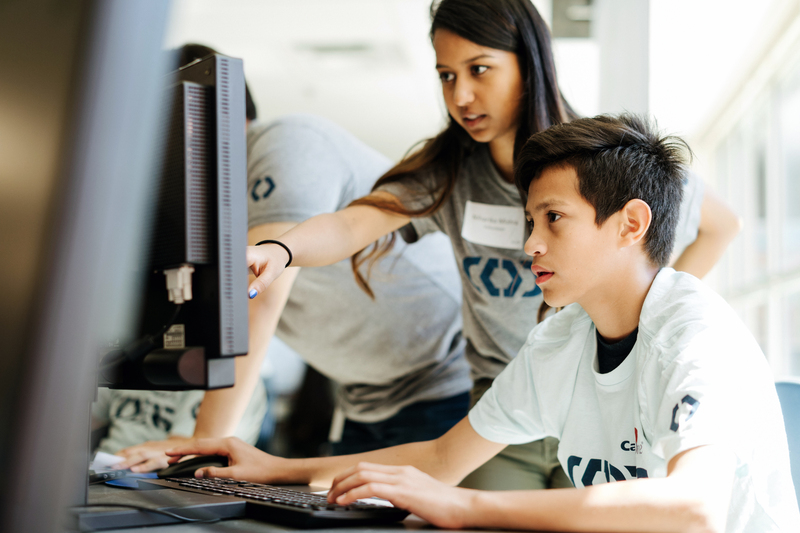 Take, for example, the more than 2,500 Capital One associates who have given more than 60,000 hours of their time to teach more than 10,000 middle school kids at 84 schools about coding—tools, syntax, variables, conditional statements, arrays, loops, algorithms, testing, and prototyping—through Capital One Coders. “What’s really inspired me is to see how the kids use their new technology skills to help their own communities solve real-world problems,” said Partridge. “I’ve seen kids build apps to help raise funds for families impacted by hurricanes, or to help kids with learning disabilities.” Not every kid will become a software engineer, but many will use coding skills in other fields to make a positive impact on the world, she added. And Coders has even motivated some employees to come up with new ways to get kids excited about STEM. For example, a Capital One associate recently piloted a program in partnership with the Science Museum of Virginia. He came up with the idea, built the curriculum, secured all the hardware components, and led a group of volunteers. The program invited students from around the area to take part in a weekend boot camp to learn how to build gaming computers from scratch. The computers were then donated to the Boys and Girls Clubs in the area. Capital One is on a journey to help teach 21st-century skills to tens of thousands of people across the U.S. But we can’t do it alone. We’re calling on companies, as well as educational and community organizations, to offer tech skills programs that prepare individuals for future economic success. And we’re encouraging not just our own associates, but individuals across the tech industry, to give their time and expertise. The best place to start is right at home in your own community. Together, we can make a dent in the skills gap, helping more people get the training they need to thrive in a digital economy.